Thanks to WGN and ABC7 News. 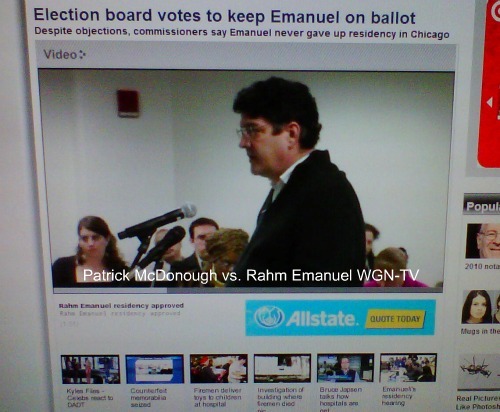 I had a chance to voice my opinions with the objectors in Patrick McDonough vs. Rahm Emanuel. No. 11-EB-MUN-007. This was on December 23, 2010. I will have a T.V. show soon so you can meet some of the objectors in person. The Chicago Media is joke in their unabashed support of the Rahm Emanuel’s Residency case. Many valid points were made and never played on the air. I also objected to the behavior by Attorneys from Mayer Brown LLP. This company makes millions of dollars from the City of Chicago and taxpayers. Is this because the City of Chicago lawyers are not able to defend a complex case? I think the law department under Mara Georges needs a cleaning. If you vote for Rahm, this will never happen. This photo was taken by Patrick McDonough from the WGN-TV website. I hope they do not mind since it is a picture of yours truly. God Bless all of you and all the people trying to clean up politics in Chicago. I hope you have a great new year. Get Your Legal Rahm Emanuel Objection here free! Fill in the blanks! Rahm Emanuel Objection.pdf Please feel free to use at no charge. 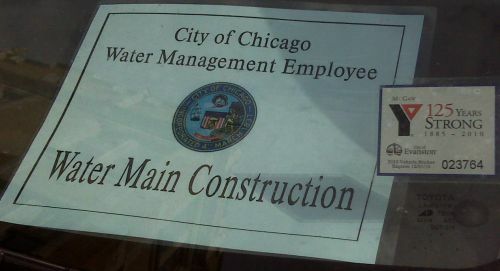 If you are a former City of Chicago employee fired for residency, enjoy!